You will get our daily posts conveniently added to your news feed. We collect the latest interesting information, news, happenings, photos, videos, local articles relating to Krabi Province and updates them daily. Make sure to click ” Like Us “ as there is tonnes of free information out here. Located on southern Thailand’s east coast, 800 kilometres south of Bangkok, Krabi Province is an area of outstanding natural beauty covered with exotic islands such as world renowned, Koh Phi Phi, Koh Hong, Koh Lanta, Koh Poda, etc. Classic virgin beaches competing with towering limestone formations and surrounded by crystalline waters fringing with colorful coral reefs. Beside the sea and sand, there are towering rocky cliffs, caves harboring Buddhist temples, waterfalls, seemingly endless plantations of rubber and oil palm trees, lush and green national parks home to different species of fauna and flora, verdant mangrove forests and inlets that wind their way under soaring cliffs of karst mountains, and much more. As well as beautiful and relaxing scenery, Krabi offers a unique “Mother’s Nature” playground for those who like to be “out there”. Rock climbing, diving, kayaking, sailing, deep-sea fishing, bird watching, snorkelling, island hopping, elephant-horse riding, camping and barbecue activities are just a few. In the interior hinderland, two predominantly national parks, Khao Phanom Bencha and Than Bok-khorani, offer rainforest attractions including waterfalls and caves, hot springs and opportunities for jungle trekking, bird watching and eco-tours. 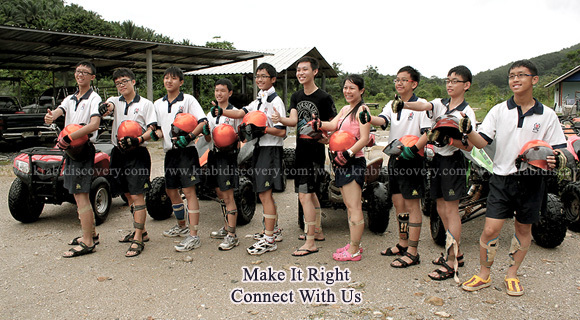 Here in Krabi Discovery, we aim to deliver and maintained our dependable and reliable reputation for our services. Being localized and on hand to assist, facilitate and custom-built your hotel bookings, package tours and customized travel itinerary. Offer the unique combination of both the personal service of a local front desk and the 24/7 cyber access convenience to all your account information. Dependable and reliable options for an on-line booking at the comfort of your home. Plan in advance, save precious time, money and avoid the hassle and frustration of doing it here at the expense of spoiling your vacation. Great cares and efforts have been taken to consolidate and link a network of working partners such as reputable hotels, resorts, bungalow partners, a list of unique tours, activities and transportation operators. We ensure that the local affiliates with our inner code of conduct are capable of managing operations in accordance with the agreed service standards by our mutual annual binding contracts with them. This is something we wish to build and strengthen by carefully selecting and identify the local partners with an excellent service record.